St Methodius was born into a wealthy family at Syracuse, Sicily. He transferred to Constantinople in Turkey to continue his education, probably with the intention of entering the Courts. However, instead, he joined a monastery, became a Monk and in time, an Abbot. 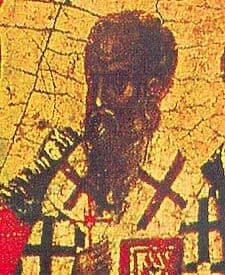 In 842, St Methodius was appointed Patriarch of Constantinople where he presided at a Local Council which restored icon veneration and established an annual celebration of the triumph of Orthodoxy. St Methodius’ Feast Day is the 14th June. He is the author of the life of St Theopanes. Pray for us that we will persevere in our struggles to overcome all barriers that hinder our relationship with the Risen Jesus.